This book presents unsolved bibliographical questions. The present online edition reproduces the 1930 volume of 227 pages published by “Theosophical Press” in Wheaton, Illinois, USA. However, contrary to what Boris suggests, this 1930 edition is not the same text published in “The Theosophist” in 1909-1910: the differences between them are profound and easy to see. In 2018, the 1930 edition of “The People of the Blue Mountains” is a rare volume and difficult to obtain in paper, except for its photocopies sold as books by Kessinger Publishing Co. The present online version reproduces the only edition in book form in English of the work by Helena Blavatsky. While the outward text of the present translation may be imperfect, “The People of the Blue Mountains” is certainly unique, inspiring, nice to read and most valuable. It has a significant place in esoteric literature and deserves the thoughtful reading of every student of theosophy. The book “The People of the Blue Mountains” was published in our associated websites on 8 May 2018. 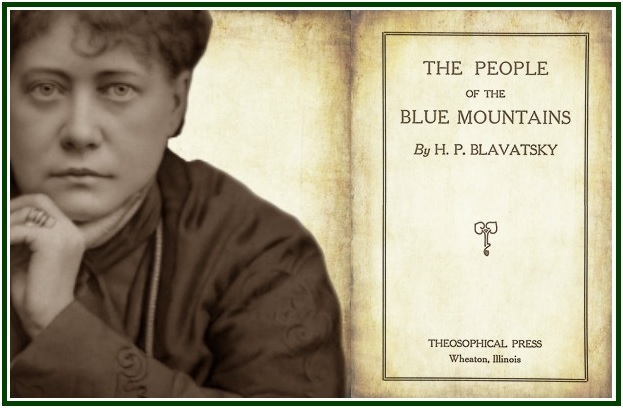 See the article “Blavatsky and the Blue Mountains”, by Joana Maria Pinho.